The Parlour, the stylish restaurant at the Roger New York hotel overlooks the intimate lobby and features marble-topped round tables flanked by blue leather chairs, navy and cream striped banquettes and window seats, and a wide wood plank floor. Votive candles on the tables, soft lighting, low music, an interesting menu by Chef de Cuisine Peter Goldklang, and attentive service create an inviting and relaxing ambience. Edward and I stayed at the hotel Roger New York in August 2012, and had an enjoyable and relaxing dinner at The Parlour, located on the third floor of the hotel. After spending the day exploring the city and seeing a few of the City's famous sights, it was wonderful to be able to dine-in and travel no further than a few floors by elevator to have dinner. The restaurant has an appealing specialty cocktail menu and we began our evening with pre-dinner cocktails, The Roger made with strawberry puree, Fee Brothers Aztec Chocolate Bitters, and Prosecco, and the Rye Manhattan made with Bulleit Rye, sweet vermouth, and Peychaud's Bitters. 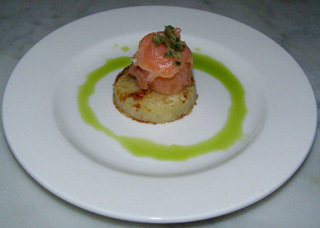 Chef de Cuisine Peter Goldklang is the talent in the kitchen and he surprised us with a delicious amuse bouché of a smoked salmon rosette on a round potato cake garnished with a caper as an introduction to stimulate our palates and serve as a taste of his culinary vision for the restaurant. The menu has a distinct bistro feel with a selection of small plates, cheese specialties from the renowned Murray's in New York City, salads, sandwiches, large plates, and desserts. 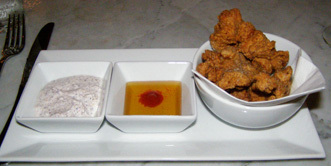 For his first course, Edward selected the Soda Dipped Fried Chicken from the small plates section of the menu served with a bowl of sriracha honey and sumac yogurt dipping sauce that provided an interesting balance of sweet hot and savory cool experiences. 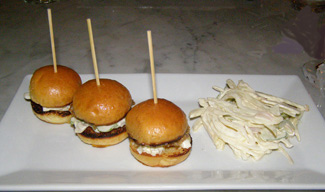 I had the Oyster Po Boy, another small plate, consisting of delectable battered Chesapeake oysters and crunchy fennel slaw served on three miniature grilled brioches and accompanied by shaved fennel slaw. 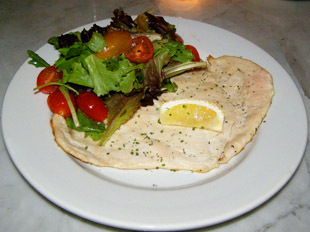 Edward continued with the Chicken Paillard, a large plate selection, accompanied by fresh herbs, arugula, heirloom tomatoes, and garnished with a lemon wedge. The restaurant has a nice selection of wines by the glass as well as by the bottle. Edward paired his chicken course with an Erath Pinot Noir from Oregon. 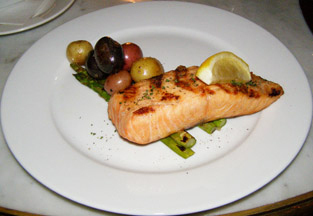 I had the buttery and delectable Wild King Salmon glazed with mustard herb butter for my second course, another one of the large plates, served on a bed of pencil-thin and tender asparagus, and accompanied by a selection of multi-colored fingerling potatoes, which I complemented with a glass of Michel Redde Sancerre from the Loire Valley of France. For dessert, Edward and I sampled the Ice Cream Sandwich, which was pistachio ice cream sandwiched between two chocolate cookies, and the Strawberry Rhubarb tart accompanied by vanilla ice cream enhanced with a swirl of dark chocolate on the plate. At the end of a lovely dinner, we rode the elevator and were thrilled that we were "home" for the evening. The Parlour serves breakfast from 6:00 am until 10:00 am, and lunch/dinner from 1:00 pm until midnight. 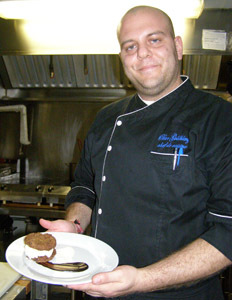 Read other materials on the Roger New York in the Hotels and Resorts section and in the Chefs' Recipes section where Chef de Cuisine Peter Goldklang graciously shares a taste of The Parlour. 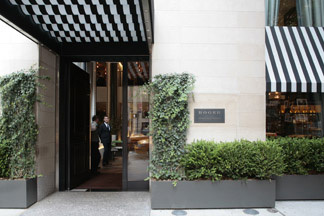 Follow The Roger New York on Facebook at www.Facebook.com/TheRogerNewYork and Luxury Experience on Facebook at www.Facebook.com/LuxuryExperience. Read other materials on New York in the Destination, Hotels and Resorts, Restaurant, and Chefs Recipes sections. © September 2012. Luxury Experience. www.LuxuryExperience.com. All rights reserved.